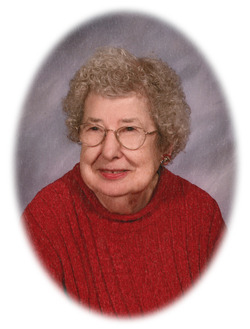 HAWARDEN, IOWA ~ Leona (Orton) Smizer, 98, of Hawarden, died on Thursday, January 3, 2019 at the Hawarden Regional Healthcare in Hawarden. Public Visitation will begin at 9:00 a.m. Monday, January 7th, Family Visitation beginning at 10:00 a.m. and Funeral Service at 11:00 a.m. at the United Methodist Church in Hawarden, Iowa. Private Family Burial will follow the luncheon. The Porter Funeral Home in Hawarden is assisting the family and condolences may be sent to www.porterfuneralhomes.com. Leona M. Smizer was born to John Sr. and Marie (Swanson) Orton in Ireton, Iowa on September 2, 1920. She was united in marriage to the love of her life, Charlie Smizer, on January 20, 1941. They farmed near Akron, Iowa where she was a housewife and to their union, they had 3 children, Larry, Linda, and June. Charlie passed away in June 1970. Leona later moved to Hawarden, Iowa where she babysat, worked at the Hawarden Cleaners, and at the Senior Citizen Center. After retiring, she made tags for several years for the Hawarden Hospital Thrift Store. She later moved to Pickstown, South Dakota to be near her daughter June until moving to Hillcrest Health Care Center in Hawarden in May of 2018. Leona was a member of the United Methodist Church at Akron and then at Hawarden. She was an avid sewer and loved to crochet, and she once mentioned that she crocheted enough to go around the world and back! She was a very caring person with a big heart for everyone and always had a smile. She is survived by her 2 daughters, Linda McKee of Huntsville, Alabama and June Reinders and husband Jeff of Pickstown, South Dakota; a brother, John Orton and wife Marilyn of Hawarden; 8 grandchildren; 2 step grandchildren; 10 great-grandchildren; and 5 step great-grandchildren. Leona was preceded in death by her parents; husband, Charlie; son, Larry; 2 sisters, Frances Christensen and Helen Falk and her husband, Alfred; a grandson, Michael; a brother-in-law; and a sister-in-law.